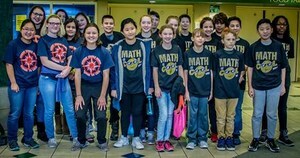 Cheney Middle School and Westwood Middle School students participated in the regional Math is Cool competition in Spokane. Both the 7th and 8th grade teams qualified to advance to the Master's Competition (state level) in Moses Lake, WA on Saturday, April 21st. Here are some photographs from the competition at Mead High School. Good luck to all of these amazing students!